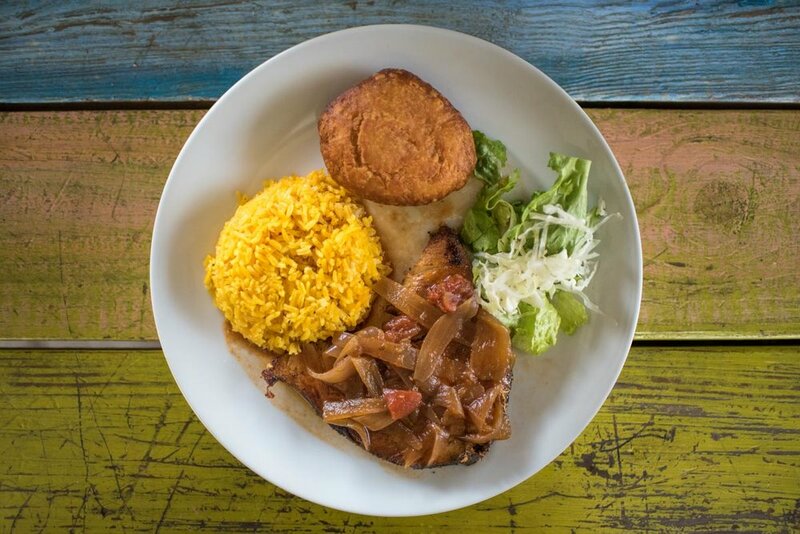 Local escovitch fish at Heritage Kitchen | Photo Credit: ©Find. Eat. Drink. Grand Cayman has long been known as a scuba diving mecca and a prime spot for offshore banking. The lure of white sand beaches, crystal clear water, and vibrant sunsets that explode in an blaze of pinks and oranges make it one of the Caribbean’s most popular vacation destinations. But travelers need to eat. Luckily, there are many options. Located south of Cuba and northwest of Jamaica, the population descends from British, Irish, Scottish, and African settlers and today there are over 135 different nationalities represented. Which means local here means a variety of cuisines. The island is relatively small, but with a diverse culinary scene, the options for dining are large. This is not an inexpensive island, but that doesn’t mean you have to pay top Cayman dollar to eat well. From Jamaican jerk barbecue to Trinidadian roti to Indian curry, here are a handful of affordable places to eat and drink, recommended by the island’s top chefs. For a more extensive array of Cayman recommendations for where to eat, drink, shop, stay, and places to explore, download the FED Grand Cayman Guidebook. Heritage Kitchen for fresh fish | Photo Credit: ©Find. Eat. Drink. This is the charming seafood shack that you dream about finding in the Caribbean and opened by one of the first families to ever settle on the island. Sit in their garden overlooking the water and dine on fresh fish, johnnycakes, and conch. Order from the outdoor shack and sit at picnic tables | Photo Credit: ©Find. Eat. Drink. This little outdoor shack is right on the beach and nestled among the sea grape trees. Order their fried snapper, wahoo, mahi mahi, or swai (white fish), and grab a seaside picnic table. You can follow the smell of the smoke to this parking lot jerk centre. They fire up a line of oil drum BBQs and grill both chicken and pork. The take-away sauces range from sweet to super spicy. Most days, they serve a side of festival, a fried Jamaican bread. Dhalpuri roti at Singh’s | Photo Credit: ©Find. Eat. Drink. Not too far from the Cayman’s Owen Roberts International Airport is this small Trinidadian roti restaurant. They serve dhalpuri roti, which are wrap-type pockets filled with oxtail, curried goat, chicken, fish, or local vegetables. On Saturdays, they feature doubles, fried flat breads filled with curried chick peas that have both a sweet and savory quality to them. Cassava Cake at Vivine’s Kitchen | Photo Credit: ©Find. Eat. Drink. You’ll feel like you’ve been invited into a local’s home because Vivine cooks Caribbean dishes in the kitchen of her own house. Her menu features oxtail and curried goat, fresh seafood such as conch, rice and beans, plantains, and fresh-made juices like mango. Save room for the cassava cake. Sunset, rum cocktail, and Indian curry at My Bar | Photo Credit: ©Find. Eat. Drink. 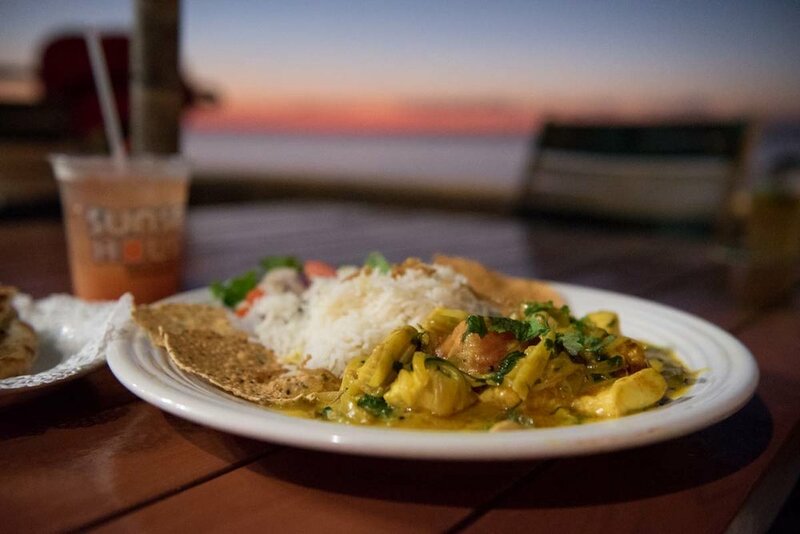 This is one of the best places on the island to enjoy an unobstructed sunset, drink rum cocktails, and eat Indian curries. The bar is set in the back of the Sunset House resort, which is a divers’ hotel and training center. Executive chef of Prime Kitchen bespoke culinary experiences in Grand Cayman. Executive Chef at Ave, Avecita, and Coccoloba Restaurants at the Kimpton Seafire Resort in Grand Cayman. Executive chef and owner of Agave - Urban Agaveria in Grand Cayman. Executive chef and owner of Smokies. BBQ in Grand Cayman. Executive chef and owner of The Genuine Hospitality Group in Miami, previously in Grand Cayman. Former Chef de Cuisine at The Brasserie and now executive chef and owner of Tomfoodery Kitchen in Grand Cayman.